leather upholstery, patch work and more! "Perfect for shoe uppers & upholstery!" The CB-8810 features a wheel foot design. This machine utilizes a knee control for the foot lift. The Cowboy 8810 is a single needle post bed sewing machine with driven top & bottom roller feed system. 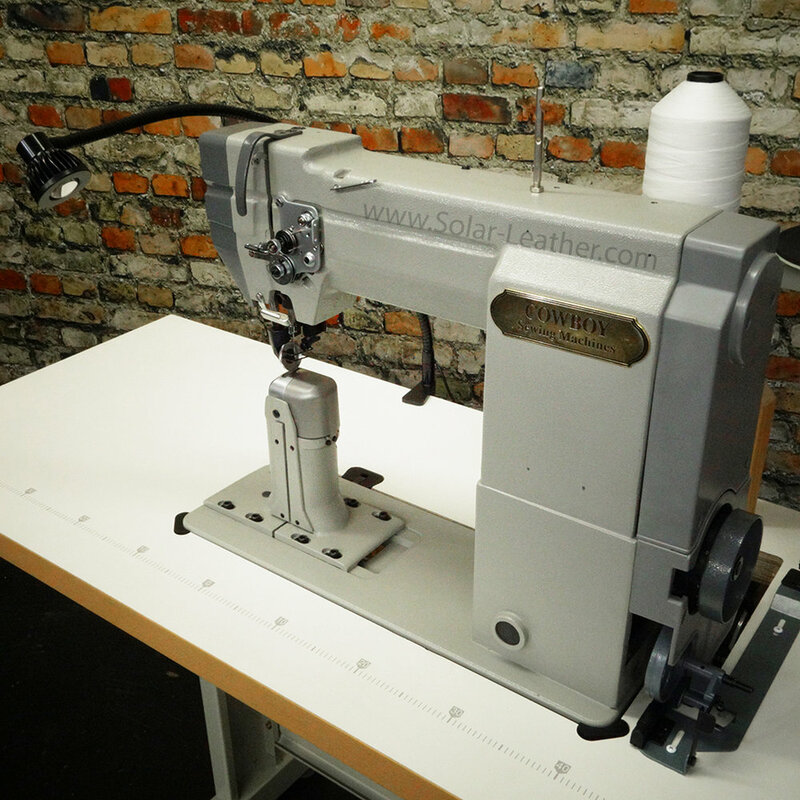 This sewing machine is designed to for stitching light to medium weight leathers, boot and show top and uppers as well as upholstery fabrics for high quality stitches. Designed with industry standard hooks, needle plates, bobbins, bobbin cases, and feed wheels that are interchangeable with readily available replacement spare parts. Designed for stitching light to medium weight items such as leathers, boot tops, shoes, straps, and upholstery, the CB-8810 is a unique machine. It can handle difﬁcult to feed material including: vinyl, polyethylene plastics, oil cloth, canvas, coated and laminated fabrics. The versatile post bed design allows you to stitch hollow, tubular and shaped items which can not normally be done on standard ﬂat bed sewing machines. This machine has a driven top & bottom roller feed system which makes it easier to do ﬁne and detailed stitching where many changes in stitch direction are required. It is set up with a powerful, quiet and efﬁcient servo motor with a speed reducer.